Despite their importance to respiration under a variety of circumstances (see  for review), the segmental control of abdominal motoneuron discharge has not been studied intensively. I  recently described diverse and often asymmetric responses of abdominal efferents of both the same and other segments to electrical shocks to the caudal branch of the left caudal iliohypogastric (L2) nerve and suggested that these responses subtend postural rather than respiratory reflexes. In this study, I tested the hypothesis that spontaneous abdominal muscle spindle activity affects the excitability and therefore discharge of abdominal motoneurons during eupneic activity. In decerebrate, paralysed and ventilated cats, I recorded the discharge of six abdominal muscle spindle afferents from a filament of the caudal branch of left L2 while simultaneously recording the motor discharges of another branch of the same nerve, of the con-tralateral L2, and of left L1. 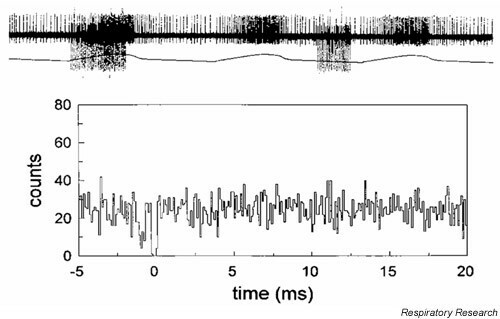 Afferents were identified by an increased discharge during lung inflation, motoneurons by augmenting activity during the inter-phrenic burst intervals. Cross-correlation of afferent activity to all motor activities revealed no changes in probability of motoneuron discharge. This was true even in one case in which the filament contained a single afferent and a single efferent (Fig. 1). These results, based on cross-correlation analysis, indicate that the discharge of abdominal respiratory motoneurons is not affected by activity of spindle afferents projecting to the same or different segmental levels. The reasons for this are unclear but may be due to multiple intervening interneurons and/or preferential projection of spindle afferents to motoneurons serving postural rather than respiratory reflexes and which are inactive under these experimental conditions. Future studies of the segmental control of abdominal muscles should be directed at evaluating connections using the more sensitive method of spike-triggered averaging and determining if postural and respiratory abdominal motoneurons constitute distinct pools in terms of reflex control.